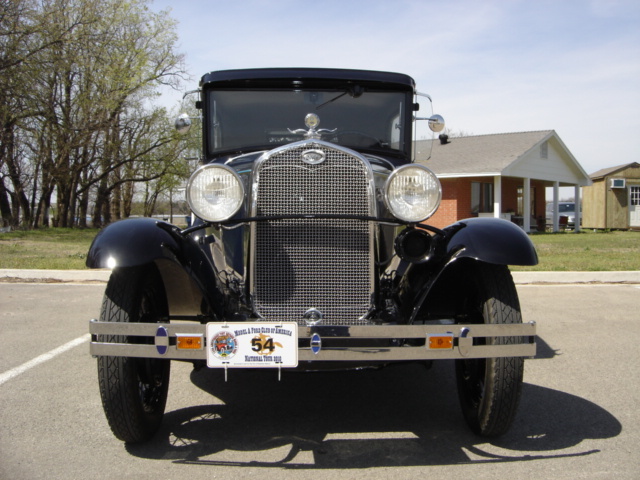 This month the Great Oklahoma Classic featured car is a 1931 Ford Model A Tudor Sedan. 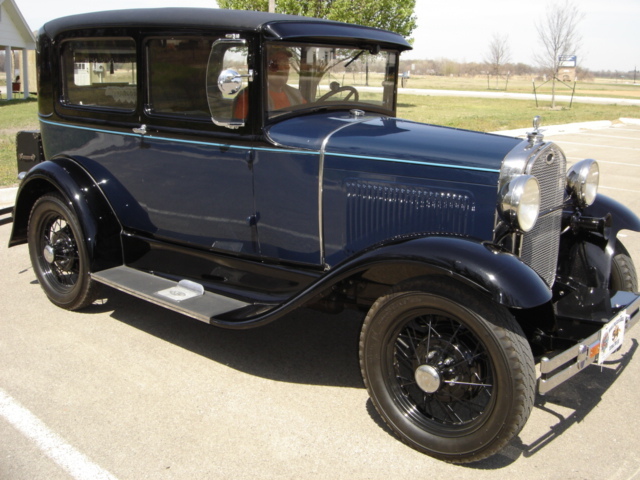 This outstanding Model A belongs to Bill and Sue Harris of Edmond, Oklahoma. We met up with Bill and Sue on April 2, when the Sooner Model A Club of Oklahoma traveled to Perkins for a tour of the Oklahoma Territorial Plaza. Over twenty Model A’s made the trip and were hosted by the Cimarron Starlite Cruisers Car Club and the OK Territorial Plaza. Bill and Sue became the third owners when they purchased the old Ford from Ed Kurtz back in November of 2001. The speedometer showed 35781 miles which Bill believes to be the original mileage. A family named Burson had purchased the car back in 1962 and Ed Kurtz purchased the car from them. The car had a co-op lubrication sticker on the door frame with a November 22, 1970 date on it. The mileage on the sticker was 34,575 so the Model A had been in storage for over thirty years. 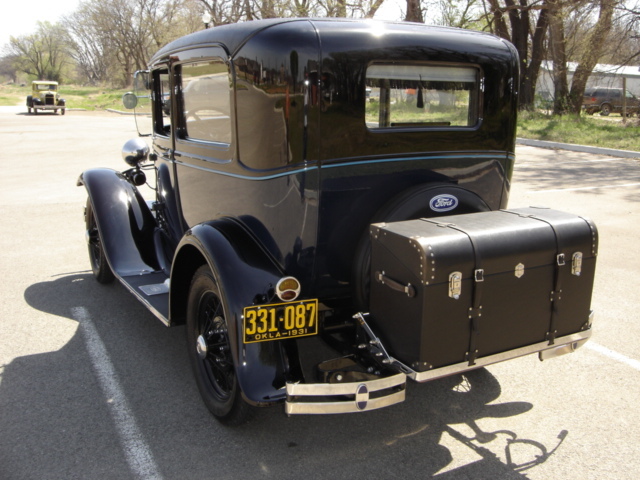 Everything on the Model A was original except the paint when Bill found this grand old Ford. 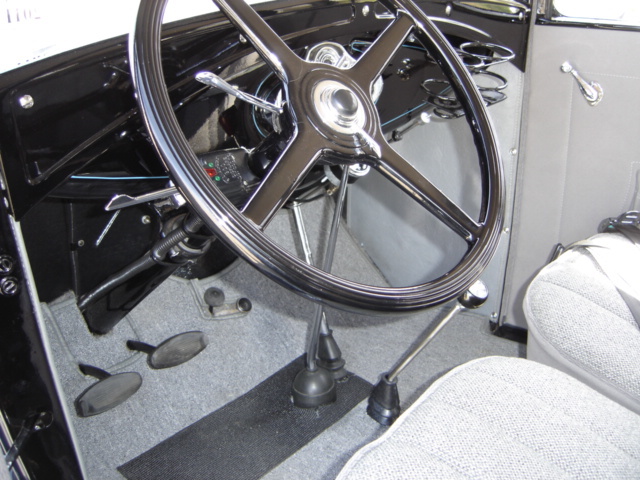 The Model A had been painted a cream color but while inspecting the car it was determined the original color was black. 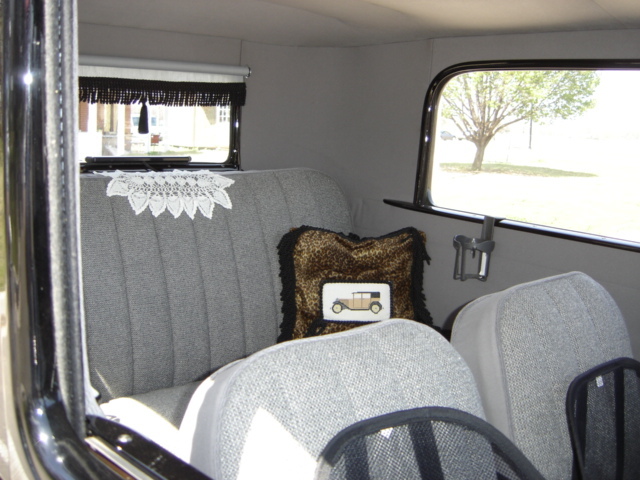 The original upholstery was still in the car and in fair shape with the exception of a split in the driver’s seat cushion. The original back pull curtain was still installed including the original rubber mats, which were in really good shape for being 70 years old. Bill could not start the car because of a gas tank full of rust. Bill first thought was to get the old ford running and cleaned up. After polishing the car and getting it to look as good as old paint could look, Bill’s wife Sue, said this is not the right color and we need to do a complete restoration. Bill recruited Herman Campbell of OKC to rebuild the engine which is a four cylinder 40 horsepower flathead standard Model A engine. 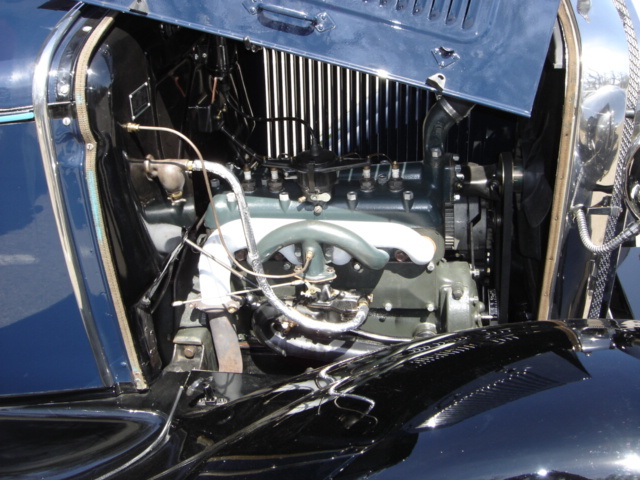 The 40 horsepower of the engine is put to the rear end by a three speed standard H pattern transmission. Bill and his friend Bill Jenkins began the restoration in December 2001. 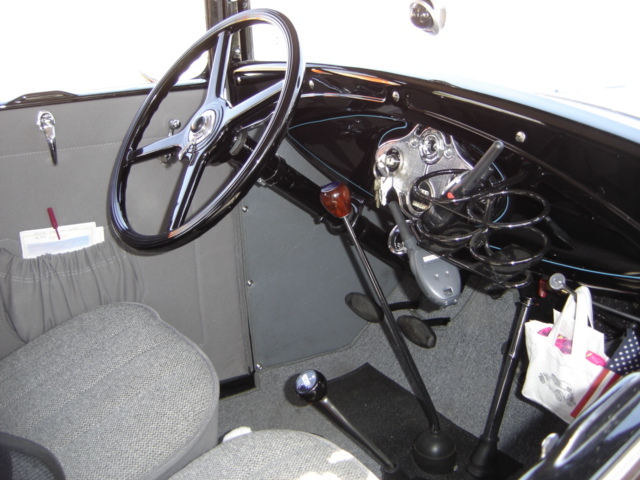 The two Model A enthusiast worked three to five days a week until the Model A was finished in May of 2002. The Ford was painted by Melvin Baffery of Edmond. The body is Lombard Blue with black fenders. Goodyear black wall tires are mounted on nineteen inch black wheels with Hessian blue striping, which was done by Fred’s Sign Company of OKC. Bill and his friend Bill Jenkins did all the mechanical work and the upholstery for the grand old Ford. Last summer Bill and his wife drove their Model A’s to St Joseph Missouri, to Casper Wyoming and back to OKC covering 2300 plus miles in fourteen days. They averaged 40 miles per hour during the trip. This trip was sponsored by MAFCA commemorating the 150th anniversary of the Pony Express. 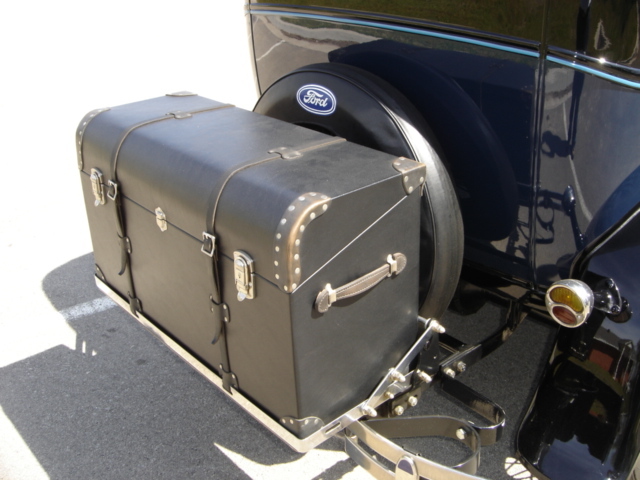 Now this is a real trunk! 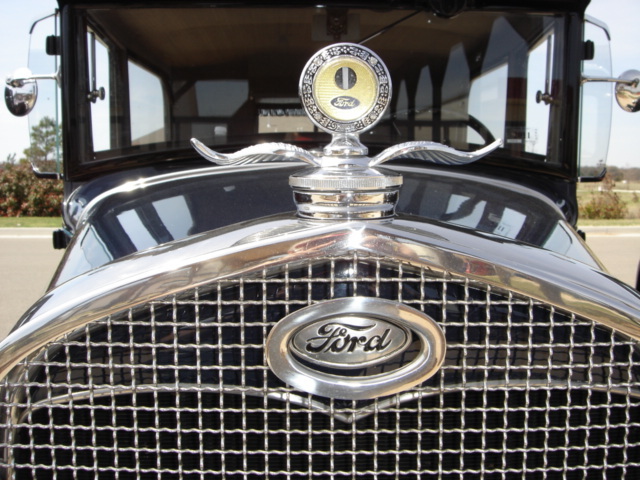 Since November 15, 2002 Bill and Sue have driven the Model A Ford 11,546 miles. The Harris's sincerely enjoy the car and are currently planning a trip to Nashville, then down the Natchez Trace to Natchez, Mississippi which should add almost a thousand miles of fun to their grand old ‘A’. The Cimarron Starlite Cruisers sincerely appreciate Bill and Sue Harris for sharing their Classic 1931 Ford Model A Tudor Sedan and letting us feature their car as the Great Oklahoma Classic for April 2011.